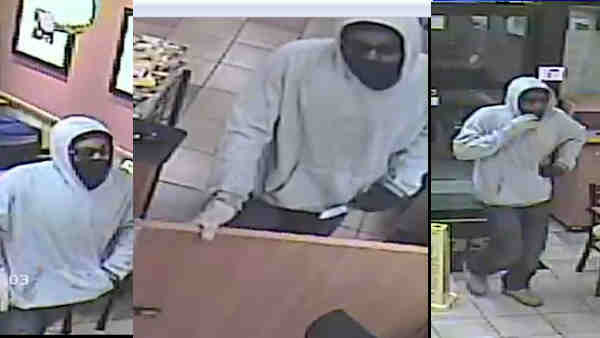 BAYSIDE, Queens (WABC) -- Police investigating knifepoint robbery at Subway restaurant in Bayside around 9:30 p.m. Wednesday. According to the New York City Police Department, a man held up a subway sandwich shop in Bayside on Northern Boulevard. Police said the man went behind the counter with a knife, and demanded the register be opened. Once the worker opened it, the suspect removed the drawer with about $400 cash inside and fled. The suspect is described as black, approximately 5 feet 9 inches, medium build, wearing a grey hooded sweatshirt, dark jeans, and boots. Police suspect this is part of a string of hold-ups. This would be the fourth robbery the suspect has pulled off at businesses in Queens recently, along with 17 robberies across Long Island. Anyone with information about the case is asked to call 1-800-577-TIPS (8477) or for Spanish, 1-888-57-PISTA (74782).